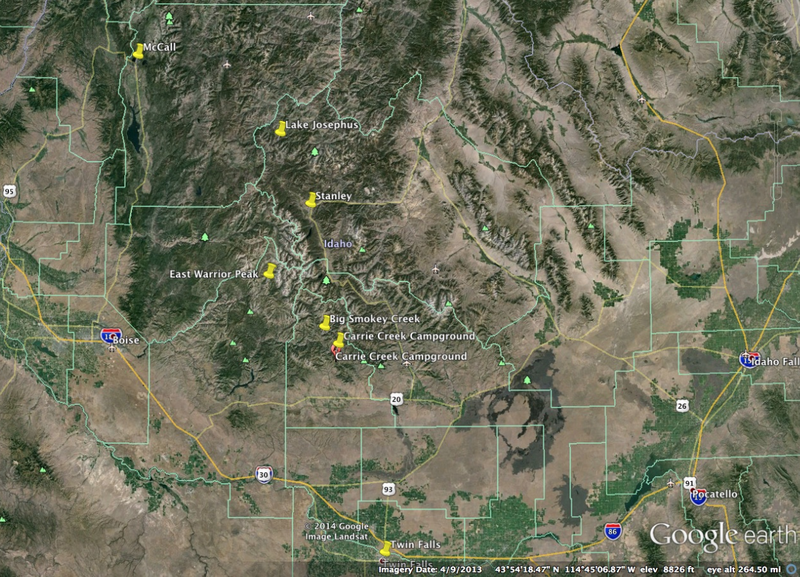 On a screenshot of Google Earth’s Idaho, yellow thumbtacks mark the sites where the writer Richard Brautigan traveled in 1961. Arline and I found some of these places when we followed in his footsteps on a literary pilgrimage described in my newly published memoir, The Ghosts Who Travel with Me. Now that years have passed since the pilgrimage, the place names have taken on a mystical quality: Stanley, Little Redfish Lake, Worswick Hot Springs. For Brautigan, too, his Idaho trip receded into nostalgia. Early in his book Trout Fishing in America, he says, “O, a long way from Idaho, a long way from Stanley Basin, Little Redfish Lake, the Big Lost River and from Lake Josephus and the Big Wood River.” This sentence appears in a chapter called “The Autopsy of Trout Fishing in America.” Brautigan’s travels into the wilderness are over, and nothing remains but the dissection. I’m drawn to nostalgia. It’s tricky because it can make us romanticize the past. But nostalgia can be more textured than that. It’s part yearning, part grief, part reckoning with complicated feelings. I’m feeling nostalgic these days about my book project coming to fruition. I poke through my computer folders, remembering how the project started. A file called “original chapters” has some that made it into the book and some that didn’t. Here is a passage that didn’t make it: “And so we went to Idaho. Two women with different accents in one car with no incriminating bumper stickers.” I liked those sentences, but they didn’t fit. My folders contain half a dozen versions of the book with the chapters in different orders. A scene that now appears late in the book was in the first chapter of the first version. I remember, too, bringing sections to my writing group. Donna Miscolta, Jennifer D. Munro, and Alma García were honest about what was working and what wasn’t; regardless, they expressed enthusiasm for the project, and that kept me going. One of them suggested the book start with the departure for Idaho. What seems an obviously good opening now just wasn’t then. By fall 2013, I was querying Ooligan Press, and the editors requested a proposal. Three months later they wanted the manuscript. When a member of the acquisitions committee emailed to say the committee had voted to accept it and the manuscript now was going to a vote of the entire press, I held my breath for five years — or was it five weeks? — until they offered me a contract. Over the last year, I have worked closely with Ooligan staff on revisions, copyediting, permissions, and marketing. Now the book is available online and at select bookstores. Already, the journey of writing and publishing the book is receding into nostalgia: O, a long way from Idaho; a long way from my desk in the attic dormer of a house where I no longer live; from critiques and revisions; from queries and proposals. Now the journey begins for readers. Another feeling I’ve had a lot of lately: gratitude. At the book launch, I asked people to stand up and be recognized: my parents; my partner; my writing group; the photographer of the author photo; the Ooligan staff; friends, colleagues, members of my writing community. I thanked Elliott Bay Book Company for hosting and Hedgebrook for sponsoring the reception. Finally, I asked lovers of books to stand up, too. All those people standing? That’s how many it takes to make a book. We all do it together. So thank you. And thank you.